I’m happy to announce the publication of a new book, Youth Cultures & Subcultures: Australian Perspectives, co-edited with two of my good friends and fantastic scholars, Sarah Baker and Bob Buttigieg. the ethical and methodological considerations that arise in relation to researching and teaching youth culture and subculture. 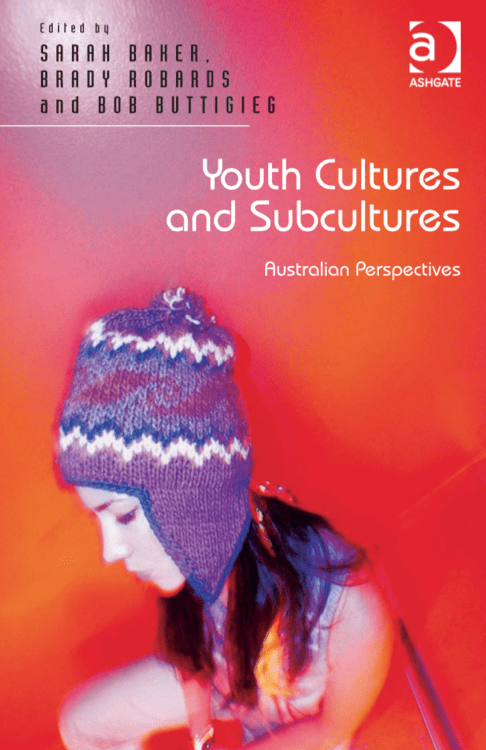 Our aim here was to bring together the latest interdisciplinary research in Australian youth culture studies to combine theoretical considerations with recent empirical studies of subcultural experience. We hope it will be a useful contribution to the field. If you are thinking about buying a copy, let me know and I can share a 50% off discount code with you. The Ashgate website doesn’t very clearly showcase the contents, so here’s a slightly more palatable TOC. 1) Australian Subcultures: Reality or Myth? 12) Where are the Straight-Edge Women? 19) Young Women, Activism and the ‘Politics of (Sexual) Choice’: Are Australian Youth Cultures Post-Feminist? 24) Reconciling Subculture and Effects Studies: What Do Students in Australia Want to Know About Media Cultures? Tagged subculture, youth, youthcultureBookmark the permalink.